Premier Farnell, the Development Distributor, is shipping the MATRIX Voice from MATRIX Labs, available from Farnell element14 in Europe, and Newark element14 in North America. The MATRIX Voice enables users, makers, and developers to create IoT applications based on sound driven behaviours, quickly and efficiently. As the Internet of Things continues to expand, the prospect of developing unique IoT solutions should excite makers, engineers, and hobbyists. However, the process of successfully integrating artificial intelligence, hardware, and software in order to create a viable solution can be both expensive and time-consuming. The MATRIX Voice aims to lower the barriers to entry for the creation and deployment of IoT voice applications. 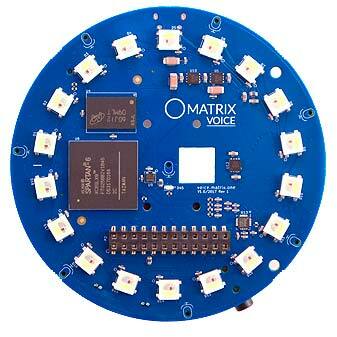 Powered by a Raspberry Pi computer or used as a standalone device with the ESP32, the MATRIX Voice specifically targets the development of voice recognition and detection projects, allowing users to utilise existing platforms such as Google Assistant or Amazon Alexa, or any other voice recognition API. The platform gives users the ability to integrate custom voice and hardware-accelerated machine learning easily into their applications. Beamforming, noise cancellation, far-field speech recognition, and de-reverberation capabilities ensure high quality performance for all voice applications.